If cancelled or modified up to 7 days before date of arrival, 100 percent of the first night will be charged. The apartment offers 3 spacious deluxe rooms with wooden floor /parquet and 28 single bed dorms. 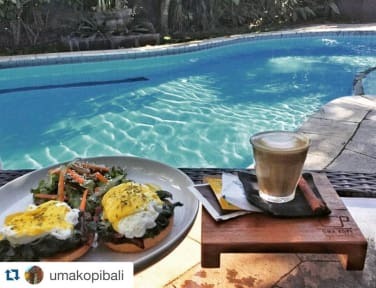 It has an outdoor swimming pool & garden, Restaurant, Coffee shop, Tour desk and Wi-Fi access is available free of charge throughout the apartment. 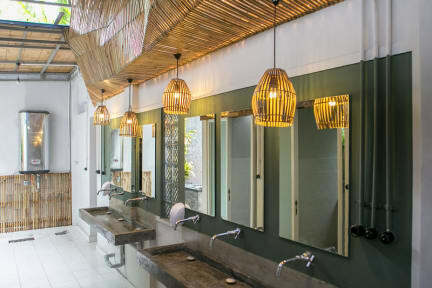 - Deluxe Rooms: A comfortable in a Balinese design whether you are on a business trip or leisure and also family gatherings holiday that can accommodate 6 to 8 people. Each room has King size bed, Air Con, Bathtub and Shower, Clothes Rack, Deposit Box, LCD TV & Cable TV Channels, DVD / CD player, WI-Fi.There is a separate share living room equipped with a desk and sofa, water boiler, cups, and microwave. Brilliant location short walk away from popular club La Favelle and great vegan restaurants. Staff are super helpful and food is decent. Would definitely stay again. Very good hostel! Pretty close to the beach and very close to alot of good restaurants and shops! The staff was very friendly and welcoming. Clean rooms, and big comfortable beds! We loved it so much the first time that we came back for another 3 days! Would recommend staying here! Great place to stay in Seminyak! My boyfriend and I only stayed for one night but we really enjoyed it. Really big private room, nice common areas and helpful, lovely staff. Location is good too. Super clean, the beds are big with nice privacy curtains/lights/plugs Fat Buddha the bar next door has the nice pool and the cafe attached does fab coffee! Staff were helpful when we asked about buses. We are returning again on our way back down before our flight! Really enjoyed staying here. Was a lovely relaxing hostel. My friend was really ill and the staff checked up on her and took care of her which was really nice of them. Would definitely recommend! Very welcoming and such a great location. We actually extended our stay from one night to four. However we did find that the water fountain always was empty when we needed it and the floors were a little grubby But would stay again for sure! Overall happy with the hostel, don’t get key for room so the door is always open. My bed was a little dirty so it definitely could be cleaner but the staff were lovely! Just a quick stop before the airport, but this place didn’t have much going on so not very easy to meet fellow travellers.